The amount of 20 USD has been withdrawn from your account. Accounts: U26xxx->U20886427. Memo: Shopping Cart Payment. Deposit to Limit Energy LTD User mari05.. Date: 17:37 01.04.19. Batch: 253881427. 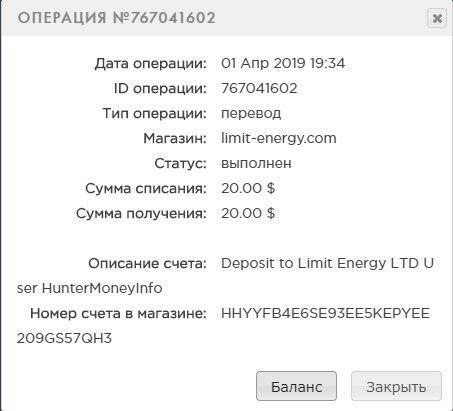 Депозит 02.04.19 08:09	Transfer	Sent Payment: 20.00 USD to account U20886427 Deposit to Limit Energy LTD User Kira. 02.04.19 10:40	Receive	Received Payment 1.72 USD from account U20886427 Memo: API Payment. Withdraw to Kira from Limit Energy LTD.